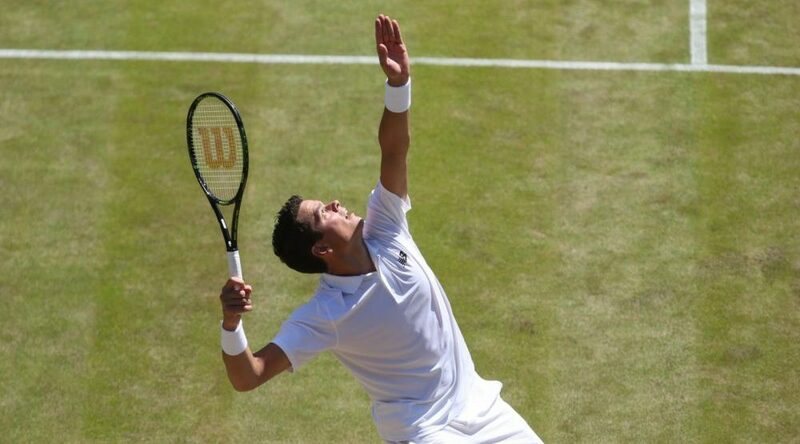 Canadian Milos Raonic has advanced to the semi-finals at Wimbledon after a four-set (6-4, 7-5, 5-7, 6-4) victory over #28 seed American Sam Querrey on Wednesday. This is just the third time that the 25-year-old Raonic has ever made a semi-final at a Grand Slam. Raonic made the semis at Wimbledon back in 2014, and did so again earlier this year at the Australian Open. With Querrey standing at 6-foot-6 and Raonic at 6-foot-5, this was a matchup of two big-serving big men. It was also a matchup of players that overcame adversity to get here. Querrey upset world #1 Novak Djokovic in the third round of this tournament. Raonic, for his part, had to come back from down two sets to defeat David Goffin in five sets in the fourth round. Querrey had no answer for Milos’ serve for most of the day. Raonic won 86% of his first serves, while Querrey won 83% of his. But it was each player’s play on second serve that was the difference in the match. Raonic won 70% of his second serves, while Querrey won just 40% of his. Raonic and Querrey traded service points in the first set until the final game, where Milos broke serve, winning the set 6-4. It was much the same in set 2, with the only service break coming from Raonic in the final game yet again. Raonic wins 7-5. It looked like it would be business as usual in the third, where at 5-5, Raonic had only lost three service points in the set. He had only lost three in the first and four in the second, as well. Then, out of nowhere, Querrey broke Raonic to take a 6-5 lead. He would hold in the last game to take the set 7-5. Fatigue appeared to be a factor in the fourth set, as each player began to see the effectiveness of their serves take a dip. Querrey had a break point opportunity for just the second time in the match in the first game, but couldn’t take advantage. The pair stayed on serve until the final game yet again, when Raonic broke Querrey, who let the service game slip away from him. Milos wins the set 6-4. Raonic has been working with tennis legend John McEnroe this year, and the big-serving Canadian believes he’s helping. Raonic has had a relatively easy path to the semis, not having to play #1 seed Novak Djokovic, who was on his side of the bracket. That will change on Friday, as Raonic will play one of the best of all-time, Roger Federer. "Nobody will fancy meeting him"
Federer defeated Marin Cilic in a come-from-behind five-set win in the quarters today. Federer defeated Raonic in straight sets in the Wimbledon semi-finals two years ago, but Milos has grown since then. Raonic has beaten Federer twice in 11 tries, including the last time they met, in the final of the Brisbane International in January.